The Isuzu Type 94 is a Rank I Japanese self-propelled anti-aircraft vehicle with a battle rating of 1.3 (AB/RB/SB). It was introduced in Update 1.65 "Way of the Samurai" along with the rest of the Japanese Ground Forces Tree. 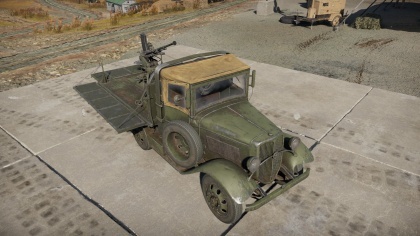 As with any truck AA, this vehicle is fragile and should not be taken near the frontline, even though it is potent as a frontline automatic antitank gun. As a truck chassis, with only 3 crew members, this vehicle has no survivability. Only one thing may save this truck in some situations: cabin's back is 15 mm thick, this can block MG fire. The vehicle has six wheels and a good HP ratio, very fast on road but bad off road; overall with a good reverse speed. 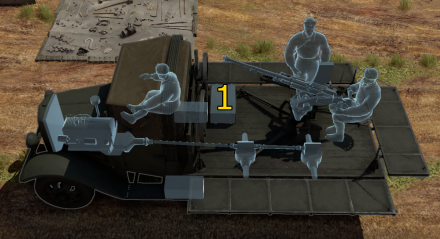 Overall, the Type 94 is a gun platform. With 20 bullets, 45 mm of max penetration, a good traverse speed and reload rate, this gun will shred planes and light targets alike. Plus, the same gun is mounted on the two next Japanese SPAAs, offering a good introduction to this main weapon. Wheels provide 2 mm thickness each. Gunner is extremely exposed, with the only meaningful armour being below the crew member. Ammo racks of the Type 94. Shooting at aircraft, you can make use of it's maneuverability to evade enemy bombs or bullets. This is not a spectacular AA since it's fire density is not so great, requiring every shot to be pinpoint on target to hit. Bring 5-6 full HE belts to take this role in case there is planes coming your way. Any good SPAA tactic works fine with the Type 94. Any aggressive player will be able to take this truck into a close quarter fight, even if it's not its recommended usage. Its fast speed and gun turning rate allows for intense action and multi-target engagement. In close quarter engagement, come in a reverse position in order to have the best gun arc and always anticipate an escape route. At this BR, 45 mm of penetration is more than enough to incapacitate most enemy tanks. But beware of its limited ammo count and always engage your target with a fully loaded magazine. It is recommended to spray the gunner first and then taking your time to snipe every other crew member. 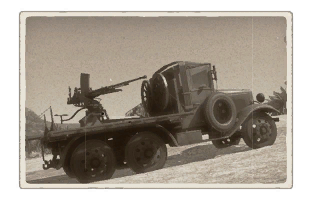 Whenever an artillery strike is coming your way, be it friendly or enemy, do not stand there for too long since a single shell can wreck this truck. One last warning: never engage heavy targets, instead: flee. Non HE shells will have hard time killing this, as the lack of armor, walls and components make it hard to actually hit anything that will sprawl and cause damage, meaning direct hits to the crew are necessary in order to take it out. Absolutely zero armor makes other vehicles able to destroy it by just spraying it with regular machine gun fire and killing the crewmen. Skins and camouflages for the Type-94 from live.warthunder.com.